How will the rest of America respond? 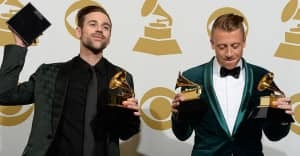 I don’t think it matters if I like Macklemore and Ryan Lewis’ new song, “White Privilege II”—a soul-searching social justice anthem centered on white entitlement and the appropriation of the black freedom movement. When I noticed its drop, around midnight as I was falling asleep, I begrudgingly pressed play, mostly because the song also features Jamila Woods, a musician and poet who I’ve met and respect deeply. I listened to the nine-minute track a single time, and did not listen again. I had no deep revelations. I was not carried to a higher state of emotional awareness. I did not burst from my bedroom and run into the streets, eager for revolution. I think this is fine, because I don’t believe the song exists to get a response from me. In music, in poetry, and in writing, I often think about the responsibility of the white artist. I know my responsibility as a black artist. I’m often excited and challenged to have these responsibilities placed on me, but even if I wasn’t, they would be there. The black artist rarely has a way to opt out of their responsibilities, especially now, when the world is both on fire and at our fingertips, when access to visible platforms exist at every turn. Black reportage through chosen craft is an expectation. Some artists step up to the plate, and some do not. But the expectation doesn’t change. The responsibility of the black artist is to place the vast spectrum of the black experience outside of the body and into a world that often works to silence those multiple, ever-changing narratives. We see this in our black hip-hop artists—though, when Meek Mill weighs in on the prison system, or when J. Cole weighs in on the war on drugs, it’s viewed as routine. What, then, to make of Macklemore? I don’t want to give white artists points for, quote, “starting a conversation.” Far too often, the dialogue that’s ignited is the sort I'd mostly disregard on Twitter and Facebook: one which discusses my existence, but ignores my voice. The responsibility of the white artist who chooses to embark on this journey, a journey Macklemore has embarked on more than once (most notably, “Same Love” and “A Wake”) is to figure out how he or she is complicit in, or benefitting from, systems of oppression, unpacking their place in it, and asking hard questions: How can I take part in dismantling this system? How can I help level the playing field? It’s a question of space, who’s taking it up, who it’s being taken from, and how it’s being used after it’s taken. A negotiation of how to benefit as an artist with something important to say while also not doing damage to anyone else. This is not exclusive to Macklemore, and not exclusive to music. I consider this when I get asked to do readings with only straight men, or with no black women. Do I enter these spaces and use my time to read 20-minutes worth of work by contemporary black women poets? Or do I say, “No thanks, call me back when you get a more diverse lineup”? I have made both of those choices at different times, and don’t believe either of them are entirely wrong—because it’s what we choose to do with the power we hold as artists. Macklemore has more power, reach, and access than almost anyone in hip-hop. He’s a white artist with pop appeal who makes the “I don’t really listen to rap, but...” section of America comfortable. He seems to be intensely aware of this, even if he doesn’t always know what to do with it. And, really, I’m not sure if any of us would know what to do with this at all times. He knows, as we know, that he’ll be praised for “White Privilege II,” while black artists who rap about the struggles of their lived experiences will remain unspectacular. But, again, if this is a question of space, and how to use the space you are afforded, I believe that I can both be frustrated with a system so eager for a white savior that they reduce black experiences, and think that there are worse ways for Macklemore to exist within that system. Another thing about narratives, especially when attached to musicians and artists, is that they have to be maintained. Saying that it appears Macklemore has grown since his last attempt to turn a mirror on himself may not be good for headlines, but it’s true. “White Privilege II” attempts hard accountability: it names the artist and others—from Iggy Azalea to Miley Cyrus—as complicit, and, very literally, amplifies the voices of those who suffer hurt as a result of their skin hue. The song ends with Woods singing, Your silence is a luxury / hip-hop is not a luxury. The symbolism of having Woods—a black woman—close out this particular song is important. And still, I was not moved. The song is fine, sure. The production by Lewis, who is having a run of studio work that I hope won’t go overlooked, is especially fascinating. I am immensely happy for Woods, who is a singular talent and a true gift. Yet, as I scanned Twitter late last night, catching sight of dueling narratives from people I respect—Black Lives Matter activist DeRay McKesson praised the song as others articulately pushed against it—I noticed a startling silence from white music fans and writers I follow. I understand how unfair this may seem. Yet, this song was not speaking to my black peers and friends, it was speaking to my white ones. It’s great to see black and brown folk publicly unpack issues in a way that challenge how I examine and process art. But “White Privilege II” was not meant to meet us where we are. I was not moved because I was not meant to be moved. The same is true of music. No one song can fully and effectively unpack where one sits in a system of oppression and start to dismantle it. This isn’t an expectation I hold, and I don’t necessarily always want to see the mess that's left when this happens. Without disruption of non-marginalized spaces, the art and the mess it leaves mean nothing. I don’t need to know how “White Privilege II” lives in the minds and hearts of black people as much as I need to know how it lives in rural Ohio. What happens when a white kid comes home from his all-white school, walks into his all-white neighborhood, sits down to a table with his white parents, tells them “I heard a song today. I want to know what you think,” and presses play?